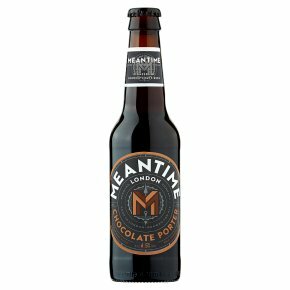 The ultimate beer for chocoholics, Meantime Chocolate Porter is like liquid chocolate mousse, made with rich, bitter chocolate. Warm and comforting with a silky mouthfeel, it is made with a blend of five rich malts and dark chocolate. Drink with casseroles, spicy Mexican dishes or raspberry desserts. A rich, dark beer with four different roasted malts, matured with real chocolate.